We sell our 15ml and 30ml Glass Dropper Bottles with a Child Resistant/Tamper Evident glass pipette. 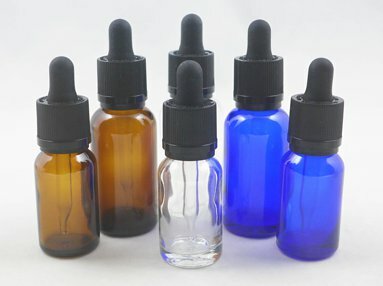 Amber, Cobalt Blue, and Clear glass dropper bottles are available. Screw the cap all the way down to seat the tamper evident ring on the Dropper Bottle cutting ring. The tamper evident band will break when the closure is unscrewed. If you are looking for plastic dropper bottles, you may also be interested in our line of Pet Vape Dropper Bottles. The CGI script you accessed is not working correctly. It didn't send any header data (possibly due to incorrect separation between the headers and the body). Please notify the author of the script of this problem. You may also be interested in our line of PET E-Liquid Bottles and our Child Resistant Dropper Bottles. For announcements regarding discounts and new products. This offer excludes Rexam Pharmaceutical Packaging.